You must be a member of the Berlin Landmarks Group to attend this activity. Would you like to join this group? 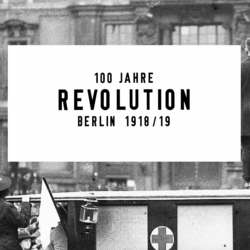 "The week begins with revolution", so why not to get together at one of the Protected content commemorating the German Revolution Protected content to understand better what exactly that meant for Germany, at that time and nowadays? Looking around, found out that "...every Monday, Kulturprojekte Berlin will turn its main premises, the Protected content into a Revolutionary Centre, where - with the collaboration of different partners- people can reflect, debate, discuss, dance and enjoy." This Monday 4.2 some special events will take place at the centre. Apart from the general exhibition (open from 10:00 to 18:00) and the freight wagon, showing historical photos of the revolution, there will be a performance of Japanese artist Chiharu Shiota "LIFELINES", (18: Protected content & a musical journey through the Berlin party scene in the Protected content together with Evelin Förster (19: Protected content .